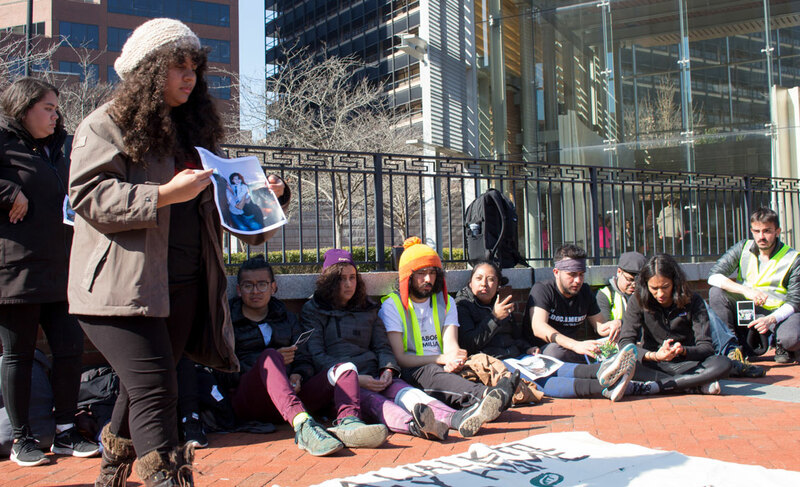 11 undocumented youth and allies held a rally in Philadelphia as part of their 250-mile trek to Washington, D.C., to demand that Congress pass a clean Dream Act. 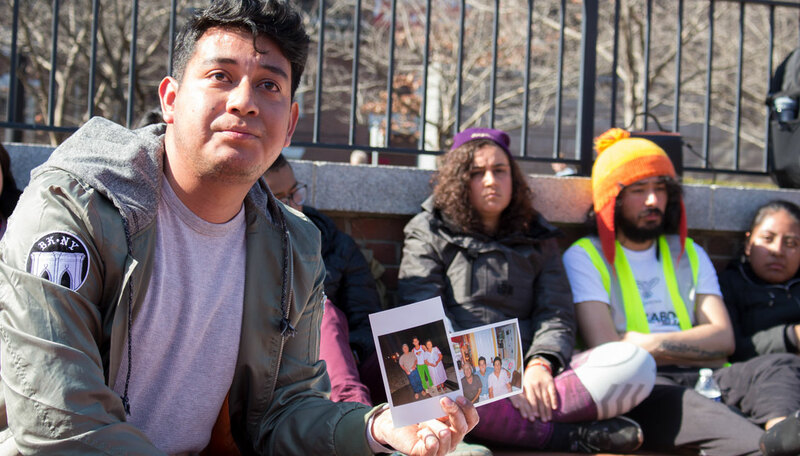 On Tuesday, undocumented youth and allies rallied outside of the Liberty Bell in Philadelphia, calling for a clean Dream Act as part of the Walk to Stay Home march, organized by the Seed Project of Movimiento Cosecha. Philadelphia is the latest stop on the activists’ 250-mile journey from New York City to Washington, D.C., where they are scheduled to arrive at the beginning of March for a mass rally on Capitol Hill. “We are tired. And those are the words that keep coming to us. We are exhausted. And we are still giving everything, our bodies, our souls, everything for us to be right here right now walking and telling the American people we are not illegal, we are not criminals, we deserve to be in this country, and we are Americans too,” said Haydi Torres, an undocumented student who is among the 11 full-time walkers, as she and other members of the group shared their personal stories with the crowd gathered before them at the rally. The 11 walkers, each holding photos of family members and friends that they have chosen to dedicate their walks to, shared emotional stories of the children, parents, relatives, and communities that have made it possible for them to build lives in the U.S., and, in some cases, are currently at risk for deportation and separation. For María Fernanda Madrigal, one of the full-time walkers and DACA recipient, her decision to participate in the march came about because of a promise to her son. She described reassuring her five-year-old while dropping him off at school one day that, per usual, she would pick him up in the afternoon. While she was driving away, she spotted a Border Patrol car by the school, “and it finally clicked to me that one day I might not be able to pick him up,” Madrigal said, explaining that once her DACA status expires, she is unsure of what her immigration status will be. Karla Rojas, a Philadelphia-area youth and DACA recipient participating in the march as one of over 50 part-time walkers that are joining for part of the way, said that she is speaking out for the over 11 million undocumented immigrants throughout the country. “We’re walking not just for the Dreamers, but for the rest of the community,” said Rojas. Walkers called for Congress to pass a clean Dream Act, defined as a permanent solution that will protect current DACA recipients and DACA-eligible youth without sacrificing the safety of their undocumented family members who may not be eligible for DACA protection. “What we’re seeing with this new administration is a change in that language and a change in the rhetoric. What they seek to do is give something to the DACA-mented individuals and expand it a little bit more so there’s about 1.8 million that are included...but at the expense of that is more criminalization of our families,” said Hector Martínez, one of the walkers and a DACA recipient from New York. “It’s taking hostage the Daca-mented individuals to pursue that policy of hate. And that’s why we say a clean Dream Act is something that does not go after our families,” Martínez added. Barbara Hernández, another walker and DACA recipient, said that she is participating in the march for her mother, whom Hernández is able to see at most once a month, when Friendship Park at the San Diego-Tijuana border opens its gates to Mexico. The action comes as Congress continues to stall on passing any DACA legislation, having failed to agree to pass a bipartisan plan despite negotiations that have gone on throughout the past month. As the imposed deadline set for March 5 by the Trump Administration draws closer, the Walk to Stay Home group plans to stage a larger rally outside of Capitol Hill on March 1 to increase pressure on lawmakers to pass DACA legislation. According to the Seed Project’s press release, about 800 DACA recipients lose their status and protections everyday, and over 1,000 will have lost their protected status by the end of the two-week march. Many of the activists of Walk to Stay Home emphasized that in calling for a clean Dream Act they have the support of what according to numerous polls is a significant majority of American voters. “We’ve seen it as we walk through these communities, as we’ve stopped to eat at the churches — the overwhelming support of those communities coming out to welcome us, to feed us, to make sure that we have clean socks, to make sure that we have medical emergency things that we might need along the way. Because really, it has been really clear that it is not just us who support a Dream act, or who believe this is a right cause, it is the overwhelming majority of the American voters,” walker and DACA recipient Eduardo Samaniego said. Many of the undocumented youth in the group noted that they have had to fight through rain and snow, suffering injuries and facing extreme fatigue as they have walked an average of 20 miles a day since they left New York City on Feb. 15. But for many, the hardship of the journey has made them all the more determined to voice their message to the rest of the country. “It is a small sacrifice in comparison to the many miles so many others have to walk every day fearing that they could be deported,” said Samaniego. “There’s so many miles so many others have walked in order to come to this country, seeking a little bit of freedom and so I think that this is a small sacrifice in comparison to all those miles that others have walked for us,” he said.